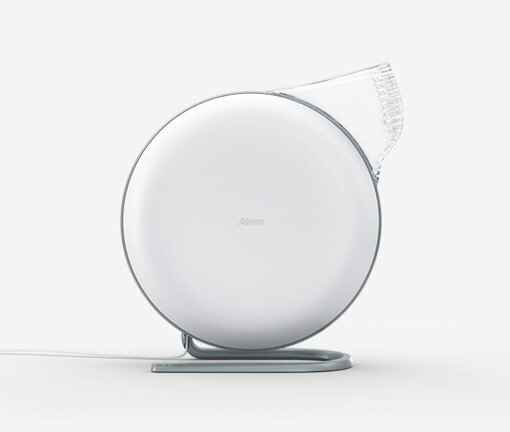 While some room air purifiers may take hours to clean the air, the Atem immediately delivers clean air to where you need it most – your breathing zone. Direct the PureJet diffuser and blanket yourself in pure air. Your IQAir Atem gives you unprecedented control of the 25,000 breaths you take daily. Sophisticated, yet simple to use. The IQAir Atem puts you in total control. Sensors respond to your touch, turning the Atem on, off, and changing fan speeds. The size of the blue light tells you the fan speed. After the third fan-speed level, a single touch will turn it off. Unlock extra features for your Atem with the app. Sync your mobile device and you can turn your Atem on and off, as well as control the fan settings. To save energy and preserve filter life, the proximity sensor signals your Atem to turn off when you walk away.